Hi, I am interested in your 1970 Ford Mustang (stock #1327-NSH) listed on Autotrader for $79,995. I'd like to get more information about this vehicle and confirm its availability. 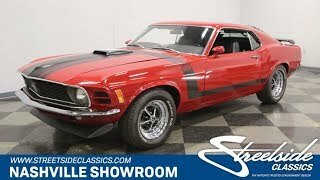 This is a very rare, and very correct, numbers matching, 1970 Boss 302 Mustang. It has also been very nicely restored to show car standards. If you are a discriminating buyer who has been looking for one of the surviving examples of the just over 7,000 cars they built in order to meet homologation rules for the SCCA Trans Am series, then you should not wait long to call or come down and check this car out. Its hard to imagine that these cars could look any better than this one does in its fresh respray of the factory correct, code T, Medium Red paint and its Black stripes. The panels were meticulously prepared and adjusted to produce this finish that is super slick with nice consistent panel gaps. Up front the black grill leads with the iconic galloping Pony over red, white and blue. Below it is a pencil thin bumper and below that is a deep chin spoiler designed to keep air from getting under the car at speed and creating lift. Triple black stripes run up and around a shaker hood with the outer ones turning down toward the rockers forming hockey stick stripes with Boss 302 appearing at the top edge of the fender. Body colored racing mirrors grace the doors and sport slats along with a black trunk lid cut the glare through the rear glass. The rear spoiler generates downforce at speed, and of course there are the traditional Mustang triple taillights underlined by another sharp looking bumper. Open the door and you will find a spotlessly clean and correct, code BA, Black interior. The door panel is embossed in a rectangular pattern with a comfortable armrest in the event that you are inclined to take this car out for a cruise, which would be a glorious thing to do. The simple two-spoke steering wheel has another galloping Mustang in the center and behind it the stock dash is extremely neat and clean with even all the thin chrome piping around the gauges spotless and shining like they should be. The factory tach is just to the right of the speedo with a water temp gauge off to the left and the fuel gauge to the right. The Hurst shifter for the 4-speed manual transmission falls easily to hand and there is an AM/FM radio just over the ventilation controls. The headliner and carpet are show car spotless and tie the look of the interior together nicely. Raise that hood and you will find a completely restored engine bay that is super clean and detailed out with a numbers matching 302 cubic inch motor nestled down inside. It even has the factory rev limiter still mounted on the drivers side fender well. These are very unique motors, developed and built for the Trans Am series, that use a high nickel content block castings with 4-bolt mains and cylinder heads that use a canted valve design so they breath better and make more power. Those heads are topped by finned aluminum valve covers with Boss 302 in blue on the sides. A Holley 4-barrel carburetor handles the fuel mixing duties and the power it makes flows out through that top loader 4-speed manual trans to the rear wheels. The chassis on this car received as much love during the restoration as the body and engine, so all the heavy-duty suspension and steering components that are part of the Boss package have been reconditioned with new bushings and painted so they function perfectly and look brand new. The rubber meets the road through BFGoodrich Radial T/As mounted on Magnum 500 wheels. If you have been looking for one of these rare and desirable cars, then you should call one of our sales associates for further details, or better yet, come on down and look this car over for yourself. It is one of the finest examples of this model you will ever find.